Carl and Cathy are from east Texas and decided to spend their 39th Wedding Anniversary on the Little Red River with us doing some fly fishing. Last Saturday was a blue bird day with temperatures near seventy degrees and the beautiful weather seemed to really turn on the trout. 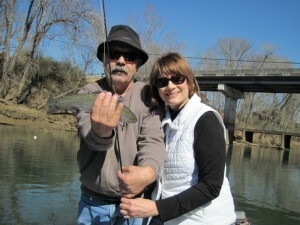 Cathy spends a lot time outdoors hiking and rafting but had not done much fly fishing. 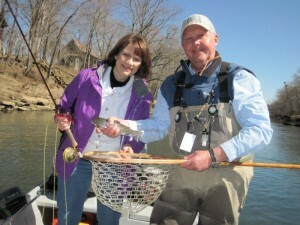 She quickly became our second client this year to catch their first trout on a fly, which in Cathy’s case was a #16 gray flashback Sowbug. Carl on the other hand has done a good deal of fly fishing and he just wore out the Rainbows on Born’s Hairy Legged Sowbug and #16 PBS’S.